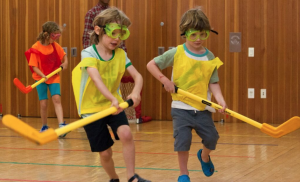 Sixes and Sevens take Choice Classes on Mondays, Tuesdays and Thursdays for an hour per class. Riddle Me This! (Woobens Celony) Riddle me this, riddle me that! Will you solve these riddles in no time flat? Get ready for the most mind-boggling game show experience of your life! Hosted by the riddle meister, in order to succeed, camper’s will be performing physical feats and answering questions based on history, mythology, geography and more! With the help of a few brave contestants, we will conquer physical challenges, solve puzzles, and answer the mysteries left by the riddle meister! Treasure Hunters (James Miner) Campers work in small groups to decipher clues that lead them to a secret treasure. 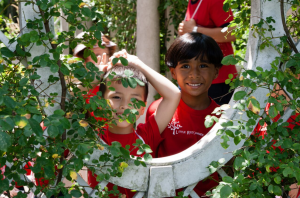 Clues hidden throughout camp will task children with challenges in the form of puzzles, riddles, maps, and physical acts of strength and agility. At the completion of each class, campers will have discovered a piece to the “final clue”. Once all six pieces have been found, campers will be able to locate the treasure and share it’s secrets! On Your Cart, Get Set, Go! (Denzel Johnson) In this class campers will be able to create their own “Go-Carts” and race and play different versions of tag games using the carts. The carts will be made out of cardboard and four wheeled scooters. 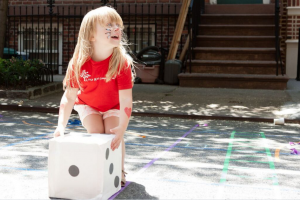 Campers will be able to explore their creative side in addition to being able to play exciting but safe and age appropriate games on the carts that they have created. About Face (Matt Mahler) Have you ever wanted to learn how to draw a face, but didn’t know where to begin? In this class we’ll learn and practice some basic skills for making a realistic portrait. 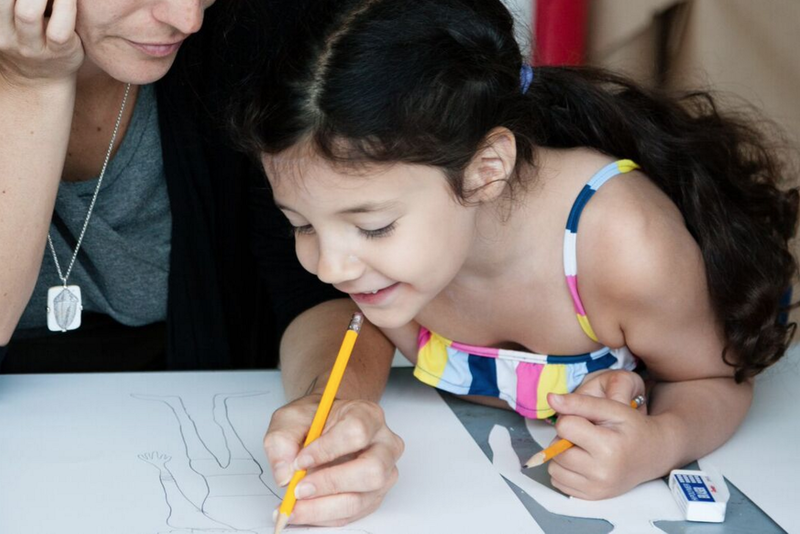 By examining self-portraits of famous artists throughout history, we’ll learn about the proportions of the human face as we practice drawing our own self-portraits. Young Dancemakers (Danielle Staropoli) Through guided explorations and games, students will create their own unique movement vocabulary, thus leading to an original piece of choreography. Students will learn how to give and receive constructive feedback and make revisions to their work to be performed and shared. Jigsaw Puzzles! (Alyssa Keene) Fun to solve and make, we will spend our time tackling puzzles both large and small before creating some of our own out of paper and cardboard. 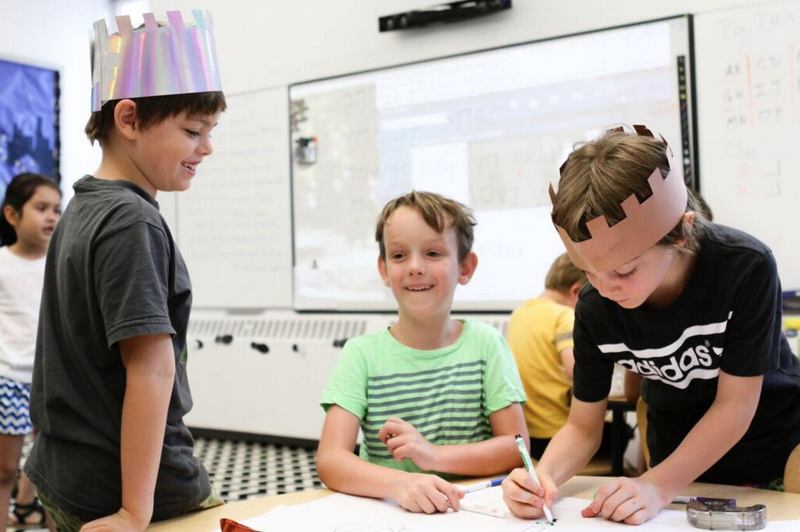 Campers will practice collaboration, design, logic, and math. Creature Combinations (Noah Furman) What would a shark, a lion, and a butterfly look like all mashed up into one? 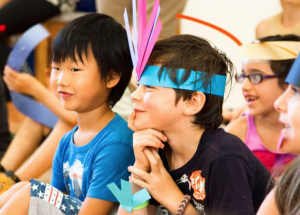 In this class, campers will get a chance to make exciting combinations of their favorite animals, using their imaginations to invent their own unique animal species! Beginning from drawings and collage, we will translate our animal combinations in paint and clay. Cosmic Cantina (Adrian Jevicki) Part snack lounge, part TV show, part meeting place for interstellar aliens (and humans! ), it’s the number 1 cafe on Mars, the Cosmic Cantina! Cosmic Cantina is a class where imaginative play and creative snack making (and eating) come together to create the most intergalactic camp class this side of the Milky Way. We will make glowing masks, bubbly drinks, mini (edible) rocket ships, and learn about the alien worlds we come from as we bring the Cosmic Cantina to life on the (little) Red Planet! Let’s Dance (Tara McLaughlin) Have you ever heard of the dance move called the shopping cart? Or the snow stomper? In this class we will explore dance and body movement, play dance games and make our own brand new future dance moves! We will practice teamwork and improvisational skill building throughout the session. Let’s Dance! My Big Art Book (Noah Furman) In this choice class, campers will make their very own art books, filled with creation made from drawing, painting and printmaking techniques. Campers will design and create their very own books, learning about bookbinding. We will try different ways of making images, including collograph prints, foam prints, and even prints made from fruits and veggies! Basketball (TBA) Meet us on the court, where we will hone our passing, shooting and dribbling skills. After practicing the basics, we will try out some game play, while developing good sportsmanship and teamwork strategies. 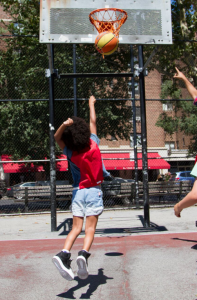 We will also make time for fun basketball games like Knock Out, Horse and others! Intermediate Chess (David Rigo) Calling all chess masters! In this class students will have a refresher on the rules and fundamentals of chess and be introduced to basic chess tactics and endgames. This is a great class for students who know how the pieces move, but might want a little review and a chance to hone their skills. Will it Fly? 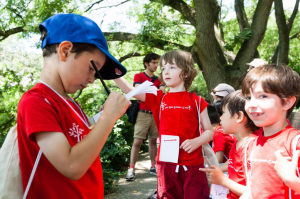 (TBA) We will design paper airplanes, parachutes, kites, use balloons and bubbles…! Each class will be dedicated to creating a unique flying contraption out of various, light-weight materials and then test run them both inside and outside. 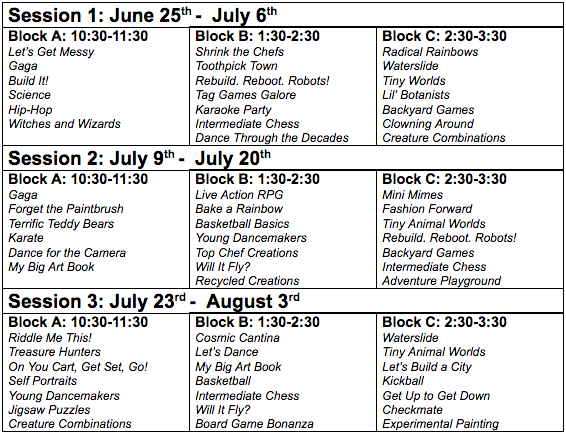 Board Game Bonanza (TBA) Campers will discover all the forms board games can take. There are so many different types of games to choose from, whether they are based on resources (Catan, Monopoly), cards (Uno, Dominion), conquering (Risk) or even legacy (games that change each time you play!). The possibilities are endless! Waterslide Time! (Hannah Galgiani) Do you ever feel like you are not getting enough time on the waterslide? Are you always the first in your bathing suit and ready to go? Then waterslide time is for YOU! Come join us on the roof (in sun or in the shade) for a great time. Tiny Animal Worlds (Vicky Sideropolous) Calling all animal lovers! In this class, each camper will pick an animal, either real or imaginary, and create a mini habitat for it to live and play in. First we will design and make our animals out of clay. Then we will work on creating the animal’s habitat with a variety of different materials including shoeboxes, moss, string, leaves and twigs. The class will conclude with a camper-led mini Natural History Museum! Let’s Build a City! (Alex Checkman) Campers will work together to recreate our favorite New York City buildings. 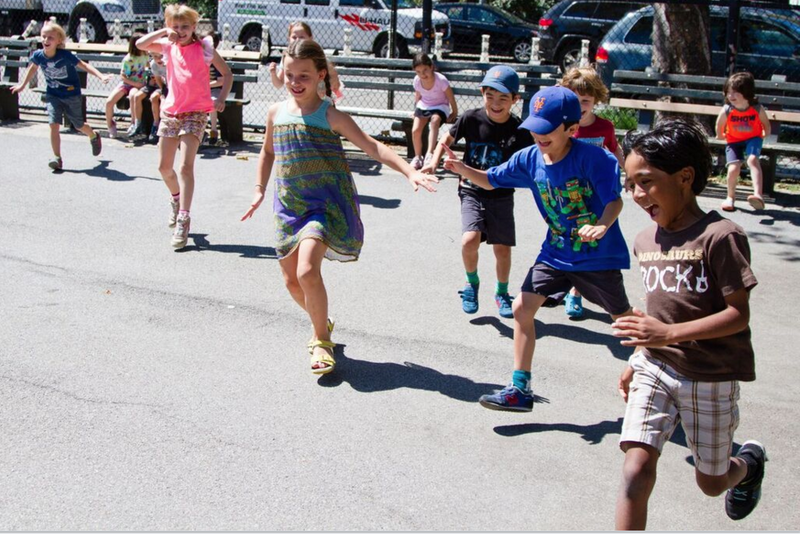 Through trial and error, campers will learn about weight and balance as they construct their buildings. We will build our structures using Unit Blocks and decorate them using plasticine, paper, and fabric. Let’s get building! Kickball (TBA) Join us as we play this summertime classic! Campers will learn the rules and practice their kicking, running and fielding skills. Once we have mastered the basics, we will break into teams for some game play, where we will work together while practicing good sportsmanship and having fun. Get Up to Get Down (Danielle Staropoli) Dance dance dance! This class will explore many aspects of dance technique including flexions and extensions, limb rotations, stretch, swings, bends and twists, plus control in balance (two feet, one foot, other body points). We will use our new techniques to collaborate in improvisations, while inventing original movements in response to music, images, words and ideas. Checkmate (David Rigo) Are you ready to take your chess game to the next level? This class will focus on checkmate patterns, and solidifying the concepts of check and checkmate. This is a good class for students who are comfortable with rules of chess. Experimental Painting (Noah Furman) In this choice class, campers will try their hand at a variety of techniques and tricks to paint without using a brush! Stenciling, stamping and printing to make colorful and unique designs, campers will learn about color mixing and paint using tape, making surprising shapes and patterns. Campers will try tactile and fun ways of pouring paint and even using shaving cream to marble paper. 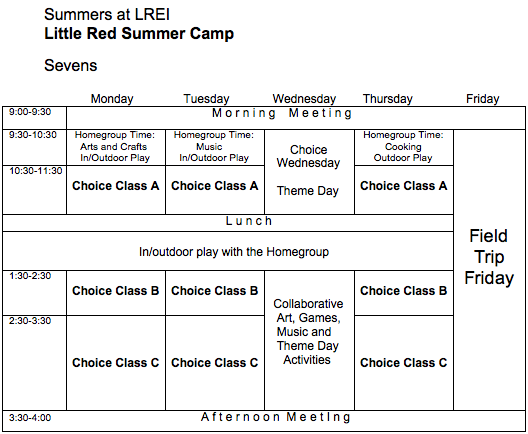 Sixes and Sevens take Choice Classes together which meet Monday, Tuesday and Thursday for an hour. Gaga (Woobens Celony) The classic camp game is back! For those who don’t know, Gaga is a version of dodgeball that promotes friendly competition in a safe form, while still giving campers an opportunity to run around and use their bodies. Don’t let the ball hit your feet, or you are out! Gaga players use all of their intellect, speed and skills. Are you up for the challenge? Forget the Paintbrush! (Cody Rae Knue) Have you ever felt that paintbrushes are too limiting? In this class, we’ll explore how to make paintings using unusual and wacky items. We’ll test out the kinds of textures, shapes, and marks that are made when we use different types of tools such as potatoes, spray bottles, combs, and more! 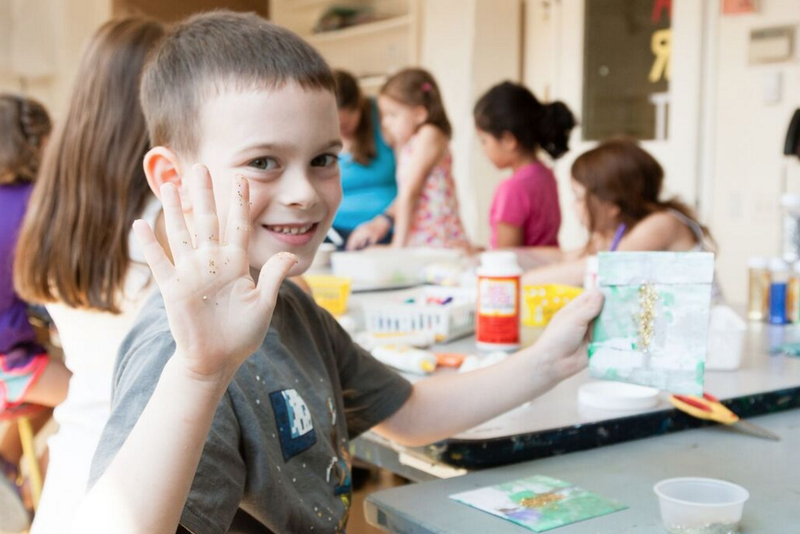 Campers will combine and build their own “brushes” to create their personal and collaborative paintings. Terrific Teddy Bears (Calla Kennedy) Terrific Teddy Bears is a fantastic opportunity for campers to make a brand new stuffie! We will first design our stuffie with markers on paper, then cut and sew our lovable creations, adding details, outfits and accessories, ending in a Teddy Bear party! Karate (Vinnie Barile) An introduction to the basic moves and ideas of Karate. 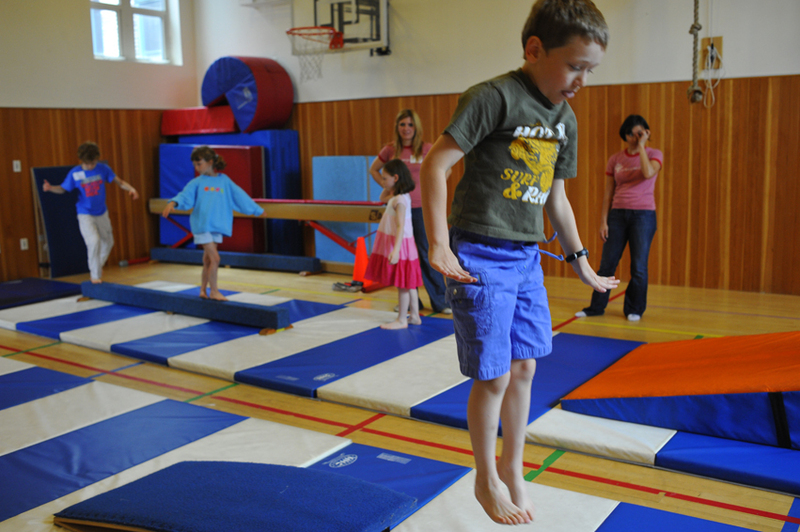 Activities will focus on building strength, flexibility, coordination, and spatial awareness. Dance for the Camera (Danielle Staropoli) Students in this class will be dancers, choreographers and cinematographers as they design, perform and help produce their own dance films. 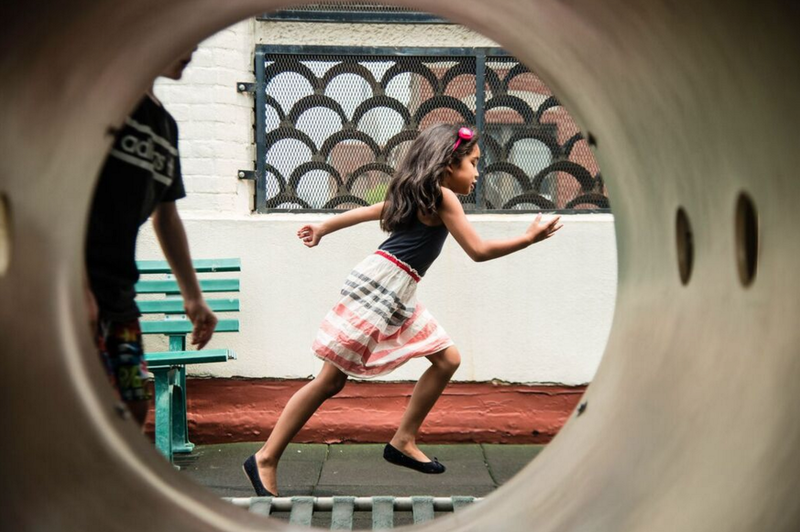 As we work on our films, we will learn ways of framing movement and putting forth an idea using the body and lens. Films will be screened in a final share for other campers on the last day of class. My Big Art Book (Noah Furman) In this choice class, campers will make their very own art books, filled with creations made from drawing, painting and printmaking techniques. Campers will design and create their very own books, learning about bookbinding. We will try different ways of making images, including collograph prints, foam prints, and even prints made from fruits and veggies! Live Action RPG (Woobens Celony) Have you ever wanted to be the hero of a fantasy tale but never had the chance? Well now you do! By taking on another perspective and living in a story, we will choose a universe to play in and assume a new identity. Learn the basics of roleplaying games as we take the game into the real world, by creating a character, getting gear, and having adventures! Bake a Rainbow! (Annie Perales) Who doesn’t love eating colorful treats? In this class, campers will gain a sense of responsibility, collaboration, and creativity by making and baking a variety of rainbow colored goods. We will be making recipes such as red velvet cupcakes, lemon bars, and some new recipes of our own! 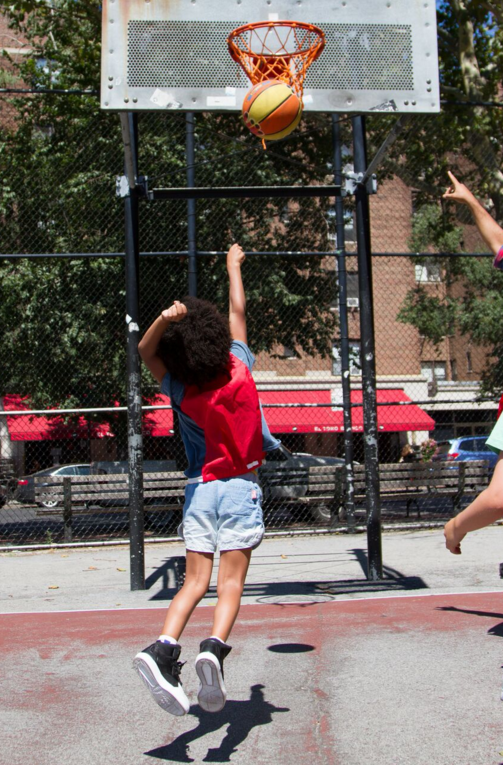 Basketball Basics (TBA) Meet us on the court, where we will hone our passing, shooting and dribbling skills. After practicing the basics, we will try out some game play, while developing good sportsmanship and teamwork strategies. We will also make time for fun basketball games like Knock Out, Horse and others! Top Chef Creations (TBA) Do you love to cook? Bake? Decorate? Do you think you have what it takes to take an ordinary dish like pancakes and make it extraordinary? Then join us as each class we take the top chef challenge and learn to cook a variety of treats with our own creative twist! Will it Fly? (TBA) We will design paper airplanes, parachutes, kites, use balloons and bubbles…! Each class will be dedicated to creating a unique flying contraption out of various light-weight materials, and then testing them both inside and outside. Recycled Creations (Noah Furman) How can what we throw away be re-used, reclaimed and repurposed to make something new and unique? In this choice class we will take a second look at materials like cardboard, plastic, paper, and foil and try making collage, bricolage, and assemblage. Working from making relief sculptures and moving into three dimensions, we will find ways to bring these materials to life! Mini Mimes (Andy Hunter) Do you like to use your body more than your words? Then join us for a mini mime extravaganza! This class is a fun twist on a French classic. We’ll explore the world of mime as we use our imagination to lift invisible cars, juggle invisible swords, and of course, get ourselves trapped in invisible boxes! Fashion Forward (Hannah Galgiani) Here is your opportunity to become a real fashion designer! In this class we will design shirts, bags and accessories and use different materials to craft elaborate outfits. At the end of the two weeks we will have a fashion show for other campers to share what we’ve created! If you like to get messy and express your style with fabric paint, tie-dye and more – come join us at Fashion Forward. Tiny Animal Worlds (Vicky Sideropoulos) Calling all animal lovers! In this class, each camper will pick an animal, either real or imaginary, and create a mini habitat for it to live and play in. First we will design and make our animals out of clay. Then we will work on creating the animal’s habitat with a variety of different materials including shoe boxes, moss, string, leaves and twigs. The class will conclude with a camper-led mini Natural History Museum! Rebuild. Reboot. Robots! (Cody Rae Knue) Let’s get building! We’ll activate our engineering skills to transform cardboard boxes and other recyclables into life-size robots. Together we’ll problem solve ways of building our new friends as big as us. We’ll incorporate foil, different shaped cardboard, and paint to decorate them. 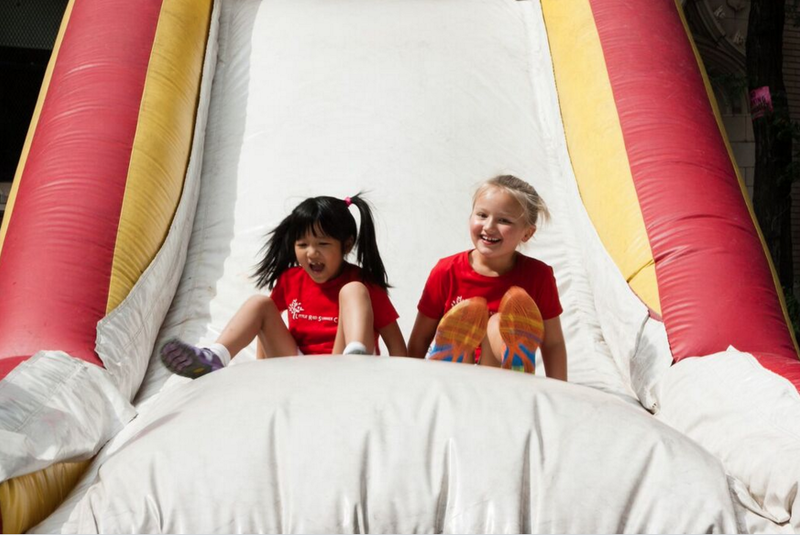 Backyard Games (TBA) Campers will learn to work as a team, form strategy, practice agility, and have fun as they learn backyard games such as Spud, Steal the Bacon, Capture the Flag, Kickball, and Giants, Wizards, and Elves. Campers will have the opportunity to invent their own games using various materials such as cones, balls, flags, etc. Adventure Playground! 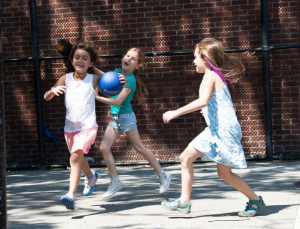 (TBA) Jump, run, and play as we explore a different neighborhood playground for each class. Sixes and Sevens take Choice Classes together that meet Monday, Tuesday and Thursday for an hour. Let’s Get Messy (Rachel Kaly) In this art class, campers will get to use their bodies to make messy projects. Leave your boring ol’ paintbrush and colored pencils at home, and bring some clothes you don’t mind getting a little dirty! Build it!!! (Matthew Mahler) Have you ever wanted to build a robot out of cardboard and tin foil? A building out of toothpicks? Your own arcade game out of found materials? Or challenged yourself to build something using just clay and string? In this construction/art class we will work with cardboard, paper, wire, clay, string, paper mache, paper clips, rubber bands, paper plates, and toothpicks to see what kinds of structures we can invent and build. In this class, if you can think it you can build it! Science! (Calla Kennedy) In Science! we will conduct experiments in which we will watch things grow, decompose, explode and freeze! We will work with our friends to discuss the reactions we are witnessing, and will we certainly have fun getting our hands dirty! Hip-Hop (Danielle Staropoli) In this exciting class, students will learn the most popular dance moves to the coolest music. Rhythm, coordination, and musicality are key components to this class that teach students to pop, lock, and boogie. The students’ moves will take center stage as they freestyle and put their own spin on the moves! Witches and Wizards! (Cody Rae Knue) Double, double toil and trouble! 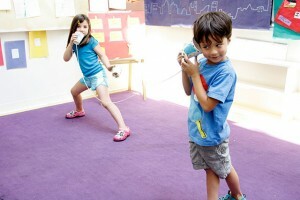 In this class we’ll tap into our special powers to make our very own bubble wands and spells to go along! Don’t forget your cauldron – we’ll need them for our fizzy potions and Witches’ Brew paintings we’ll create together. We’ll even make photographs called Sunprints using sunlight and magical paper. And of course, we’ll create a magical hat, for a wizard and witch are incomplete without them! Campers will practice lots of fine motor skills. Shrink the Chefs (Morgan Wright) For the young chefs who love all things miniature, this class is for you! Every day we will learn about basic cooking techniques while we cook and enjoy a tasty, mini treat. Mini pancakes, mini muffins, mini pizzas—bring your ideas for what foods you would want to eat if you were only a few inches tall! Toothpick Town (Jaryn Stewart) Using only marshmallows, beads, Play-Doh, and toothpicks, campers will build toothpick towers and buildings as tall (or as small) as they possibly can. Let’s create a whole toothpick city together! Tag Games Galore (TBA) Tag is a classic game with many variations, each one posing a slightly different challenge! Campers will chase and be chased as they play favorites like blob tag, TV tag, freeze tag, stuck in the mud and others. We will also explore less well-known varieties of tag, and even invent rules for our very own version! Karaoke Party (Tara McLaughlin) If you like to sing along to your favorite songs, then this is a great choice for you. In “Karaoke Party,” we will become more familiar with music, singing and performing. Campers will come up with a list of their favorite songs and perform them with a real microphone to an audience of friends. We will dress up and use props too! Our main goal is to have fun and create a safe space where campers can feel comfortable expressing themselves through music. Some additional projects during the session will include a group effort to create new lyrics to our favorite songs. The final class will be a share for other campers to join our Karaoke experience! Dance Through the Decades (Danielle Staropoli) Let’s do The Bop, the Mashed Potato, Hustle, Moonwalk, Roger Rabbit and the Cha-Cha-Slide. Let’s hop into a time machine and learn dances from past decades and create dances for the future. We will create our very own individual and group dance moves, and share them with our friends at camp dance parties! Radical Rainbows (Alyssa Keene) Let’s make this summer a colorful one! Using rainbows as our inspiration we will create ready to wear art! First we’ll learn how to marbleize clay and experiment with mixing the colors of the rainbow while creating bracelets and necklaces. Then, we’ll delve into the world of knitting by creating finger knit rainbow scarves. 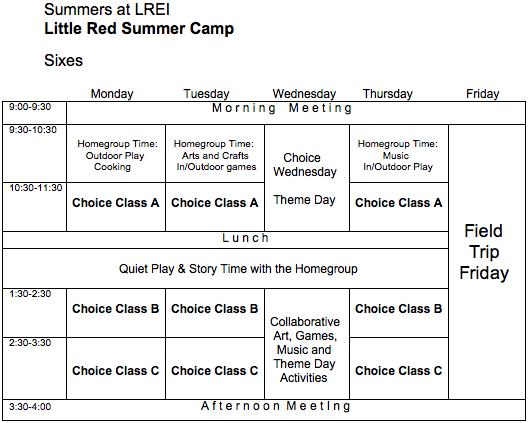 Campers will practice design, math, and fine motor skills. Waterslide Time! (Hannah Galgiani) Do you ever feel like you are not getting enough time on the water slide? Are you always the first in your bathing suit and ready to go? Then water-slide time is for YOU! Come join us on the roof (in sun or in the shade) for a great time. Tiny Worlds (Clara Campos) In this art/construction class, we will create tiny worlds using our big imaginations. Projects will include gnome homes, tiny oceans/aquariums, and mouse museums. Materials will include boxes, jars, wood, cork, string, twine, buttons, and many other tiny things perfect for building tiny worlds! Lil’ Botanists (Cody Rae Knue) Let’s explore the world of plants and nature together! We’ll take nature walks to our local parks to sketch in our homemade field notebooks the plants we find. We’ll also make textured rubbings and plant based mobile sculptures. Let’s roll up our sleeves and get dirty as we plant our own little garden in pots we create and design ourselves. Each day, as we watch our garden grow, we’ll make observations and share our findings with one another. We’ll use our notes and sketches to create a collaborative mural. Campers will practice science, observation, and fine motor skills. 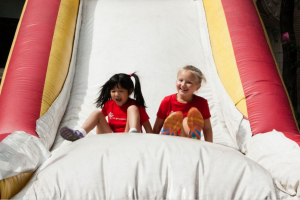 Backyard Games (TBA) Campers will learn to work as a team, form strategy, practice agility, and have fun as they learn backyard games such as Spud, Steal the Bacon, bounce out, Capture the Flag, Kickball, and Giants, Wizards, and Elves. 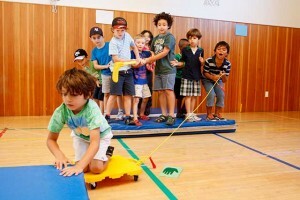 Campers will then invent their own games using various materials such as cones, balls, flags, etc. Clowning Around! (Annie Perales) Let’s explore the world of plants and nature together! 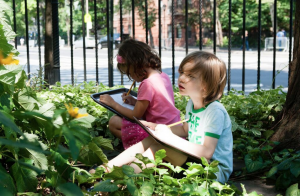 We’ll take nature walks to our local parks to sketch in our homemade field notebooks the plants we find. We’ll also make textured rubbings and plant based mobile sculptures. Let’s roll up our sleeves and get dirty as we plant our own little garden in pots we create and design ourselves. Each day, as we watch our garden grow, we’ll make observations and share our findings with one another. We’ll use our notes and sketches to create a collaborative mural. Campers will practice science, observation, and fine motor skills. 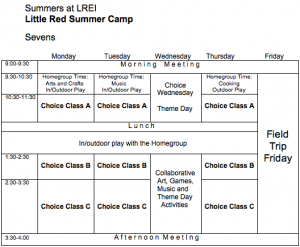 Children in our Sixes and Sevens program are divided into Homegroups. Sixes are going into First Grade in the Fall, Sevens are entering Second Grade in the Fall. 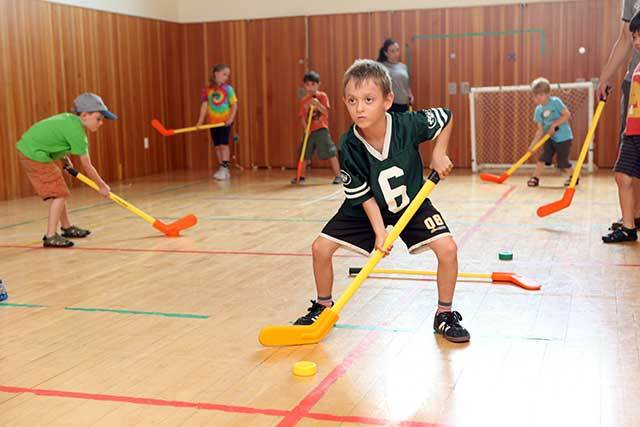 The camp day for Sixes and Sevens is 9:00am-4:00pm Monday through Friday. Registration is by two-week sessions. 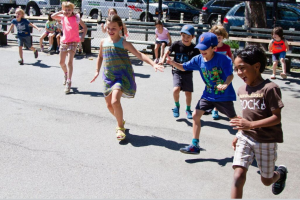 The camp program for children in the Sixes and Sevens includes organized activities and outdoor play in their Homegroups, Choice Classes which they select according to their interests, and weekly field trips. Homegroup room doors open at 8:50am. 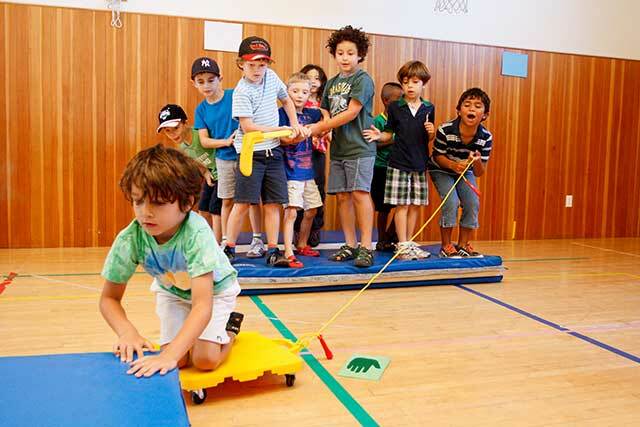 Activities are set up throughout the room in order to engage children in the beginning of the camp day. Parents and caregivers are welcome to stay in the room until morning meeting begins at about 9:10am. When registering, parents choose a Homegroup for their child. A Homegroup is a consistent place, team of teachers, and group of children that meet over the course of camp. For example, we may have as many as three Homegroups of Sixes or Sevens (“Sixes A,” “Sixes B,” “Seven A,”…etc.). 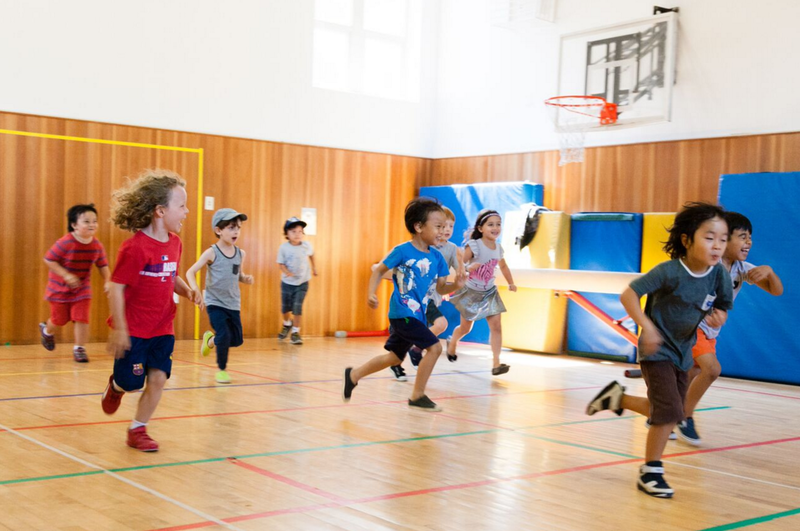 Since children in Little Red Summer Camp come from many different schools, morning meeting is an important time for campers to get to know each other and to establish a safe sense of community in the Homegroup. The meeting may include a song or game, time to discuss what will be happening during the day, and time for campers to share their thoughts and ideas. Activities on the schedule such as Arts and Crafts or Outdoor Play take place with the Homegroup. 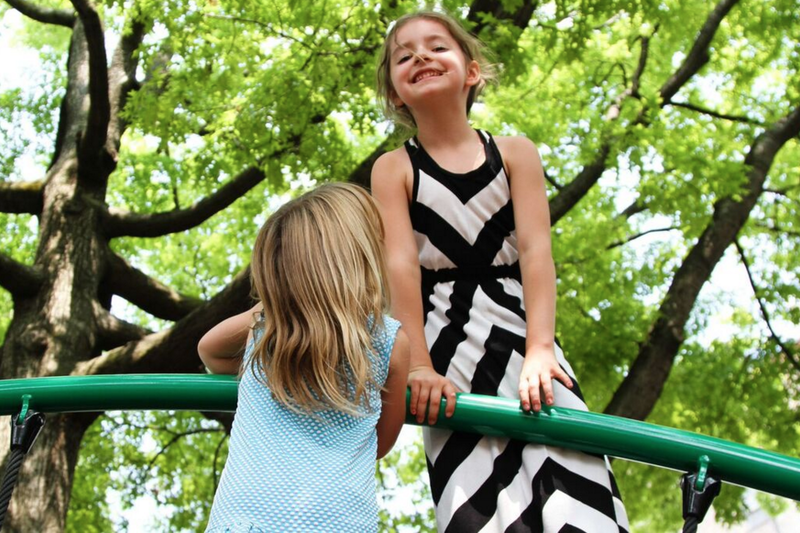 We use the Downing Street Park, our rubberized rooftop play area, and Houston Ballfield for outdoor activities. Groups may occasionally use the sprinklers, so we ask that campers keep a change of clothes and a swimming suit at camp. 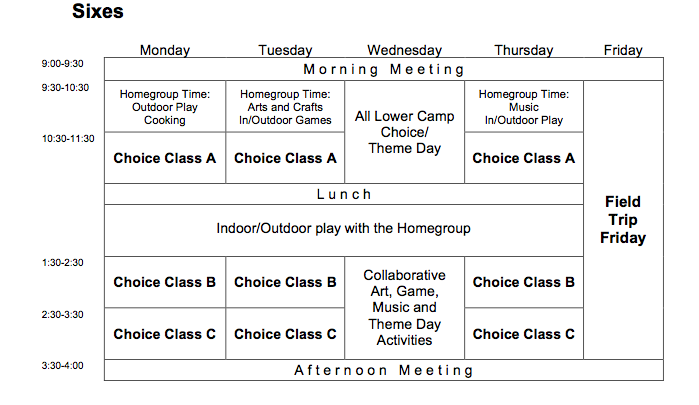 Note that the actual days for particular Homegroup activities may vary from Homegroup to Homegroup. Lunch for Sixes is provided Monday-Thursday, and served in our cafeteria. All ages have a snack of pretzels, cheese, fruit, water, and juice throughout the day. Campers bring a packed lunch for field trips on Fridays. 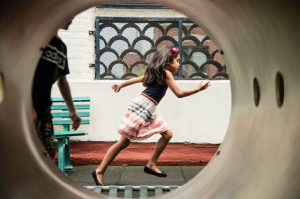 Quiet Play following lunch is simply an opportunity for children to quiet their senses without the demands of a structured activity. Some children may rest, while others may look at books, draw, or play quietly. Homegroups may also have story time or some recreation time as a transition into the afternoon activities. The camp day is closed by Afternoon Meeting, during which campers have a chance to reflect on the day and talk about what to expect for the next day. 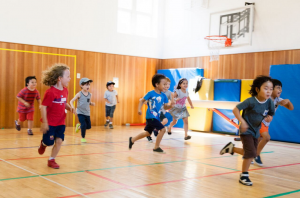 During Choice Class time (indicated as “Choice A,” “Choice B,” and “Choice C”) Sixes participate in specialized activities, which are chosen as part of registration in advance of the camp season. For most Choice Classes all Sixes and Sevens, regardless of Homegroup placement, combine for these classes. Choice Classes meet consistently on Monday, Tuesday, and Thursday for an hour each day for the course of a two-week session. The classes are taught by Specialists, Head, and Associate Counselors. Different classes are offered each session. Jewelry Making, Stuffed Creatures, How Things Work and Maskmaking! Please note: 2017 Choice Classes will be added before General Registration opens on Monday, March 13th. 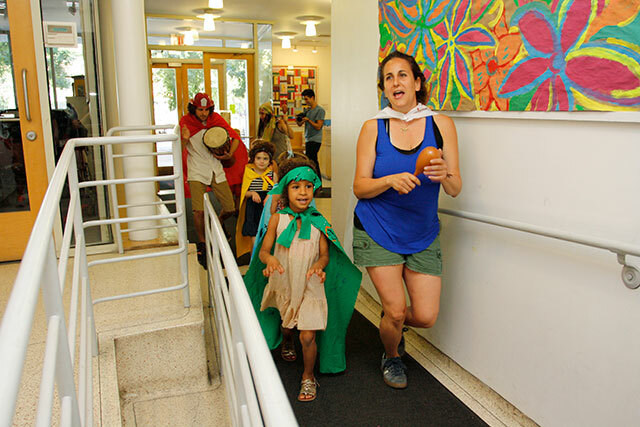 Campers in all Sixes and Sevens Homegroups gather together on Wednesday morning for a community activity such as a song or game, and then participate in mixed-age activities of their choice. These may range from making a mural to playing tag games, bird watching or creating a disco party. This is a great opportunity for friends of different ages or in different Homegroups to spend time together. 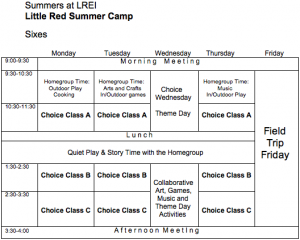 The second Wednesday of each session is a theme day, such as “The Shrinking Machine,” “Little Red Rocket Ship” or “Beach Day.” Camp-wide activities on those days are based on the theme, and each camp group chooses how it will participate in the theme. Wednesday afternoons are set aside for extended Homegroup projects, collaborations between groups, and activities related to the theme day. All Sixes Homegroups go on field trips on Fridays. 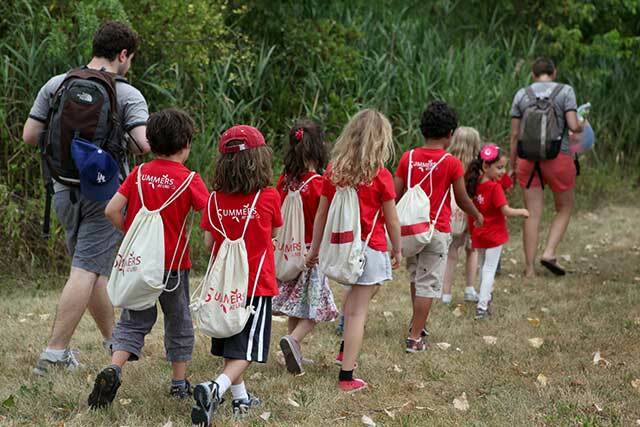 Sixes generally join the Sevens in going to locations such as Central Park Zoo and Carousel, New York Botanical Gardens, and Brooklyn Children’s Museum. We travel by air-conditioned, chartered bus. Our goal is to choose trip locations that give us a chance to be in as much “green,” natural space as possible. Our counselor to camper ratio on field trips for Sixes and Sevens is 1 to 4. All Homegroups take a field trip once a week. Trips take place on Fridays, except for the last trip of the season, which is Wednesday, July 31st. We take air-conditioned, chartered buses to age-appropriate locations for activities that are educational and lots of fun. Our priority is to take trips that give campers the opportunity to be in a natural setting or a museum worth exploring as a group. In order to maintain a very safe adult to camper ratio, Specialists accompany home groups as additional adults on field trips. For Sixes on trips we maintain a 1 to 4, to 1 to 5 counselor to camper relationship. For this reason, we do not ask for parents or caregivers to accompany groups on trips. Sixes and Sevens take three Choice Classes together every Monday, Tuesday and Thursday per two-week session. 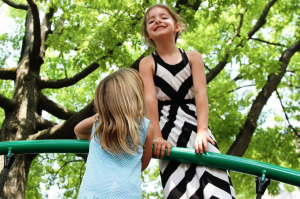 Our programs are built on the belief that children thrive when they feel safe, are supported by the adults and peers around them, and when they have both the structure and space to follow their interests.